Hair extensions can be a great way to make a dramatic change with your hair. You can go from a shoulder length bob to long layers to the middle of your back within a few hours. Or you can get some matching hair extensions to make your hair look fuller and thicker and not add any length to your hair at all. 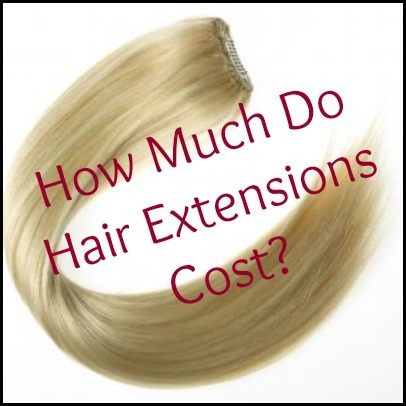 No matter the reason why you want hair extensions, you are probably wondering how much hair extensions are going to cost you. There is no exact number when it comes to the cost of hair extensions as each salon and hair stylist will charge a different amount. But, depending on the type of hair extensions you plan on getting you can get an approximate amount that you may have to pay for your extensions. There are several different types of hair extensions and techniques in way they can be applied into your hair. If you are looking for a super cheap option, you may consider simple clip in hair extensions but if you are willing to pay a good amount of money for quality extensions you may want to consider real hair extensions with cold fusion bonding. Here’s some more information to see what type of hair extensions may cost you to choose which ones may be in your budget. 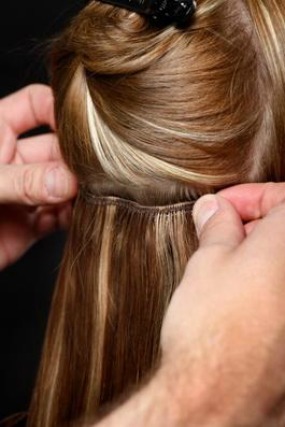 With clip-in or clip-on hair extensions you can simply by the extensions yourself and then just clip them in your hair. There is no need to visit a professional hair stylist to use these hair extensions. You can buy clip-in hair extensions from beauty stores like Sally’s Beauty or even on online at Amazon.com. They sell both synthetic clip in extensions as well as real hair clip in extensions. The real hair extensions will run you a bit more than the synthetic ones. Synthetic clip on hair extensions are rather cheap and you can easily buy them for less than $20. The thing to keep in mind is that they don’t usually last very long and some of them can’t be exposed to any heat from a curling iron or straightener. If you want extensions that may last a little longer, you may want to check out real human hair extensions. These extensions are made from real human hair and you may even find “virgin hair” extensions which means the hair has never been dyed or processed at all. The human hair extensions tend to look more realistic and they can be used over quite a few times. They will cost you a bit more than synthetic clip ins though. These extensions will range in price anywhere from $50-$300 depending on the type of human hair used as well as the color and length. If you want to get your hair extensions done by a professional stylist, hot fusion is one of the most popular techniques for applying the hair extensions to your hair. With this type of hair extension, a hot glue solution is applied to the end of the hair extension and then adhered to the natural root of your hair. There is a possibility of you getting burned, which is why it is important that you go to a qualified professional to get the hair extensions put in. This type of hair extension does look really natural as it just appears the hair is coming from the head since it is glued right to your roots. These extensions should last anywhere from 3-4 months before you need them redone. The approximately average price you will pay for hot fusion hair extensions is around $300 – $400. This includes the stylist applying them to your hair as well as cutting them and styling them to fit in with your hair cut. You may find that some higher ends salons will charge closer to $600-$800 for the base hair extensions and then may charge more for the style as well. Cold fusion bonded hair extensions are slightly newer and you may not be able to find a stylist who does this technique in all salons. If you can though find a stylist who does cold fusion hair extensions you should really consider getting these over the regular hot fusion. Cold fusion is much gentler on your natural hair as you don’t have to use a hot glue to put the hair extensions in place. Instead a keratin-based polymer is used to attach the hair to your roots. As mentioned this will cost you quite a bit more, but then again these hair extensions will last slightly longer as well. Cold fusion extensions should last anywhere from 5-6 months. Depending on the salon, these hair extensions cost approximately $1500-$2500. You will find that a lot more higher end salons carry these type of extensions, which also another reason why you can’t get them for as cheap at a lower end salon. These hair extensions involve using very small copper coils to string your hair through to attach it to the root of your own hair. This method is also gentler on your hair than the hot fusion technique. The coil hair extensions can only be used in certain instances as some women with very thin or fine hair may not be able to use them as they may show through the hair too much. If you have thicker or coarser hair, it may not be a problem at all. Coil hair extensions are also slightly more expensive as they range from $700-$1000. A weave is quite a bit different then you normal hair extensions as they are not just adhered to your roots but they are braided into your natural hair at the roots. Usually with a weave, the hair will cover your entire head, giving you a completely different look rather than just adding in 8-10 hair extensions in your own hair. There are some women though, that use a weave to make their hair look thicker and fill in any thinning spots they may have. 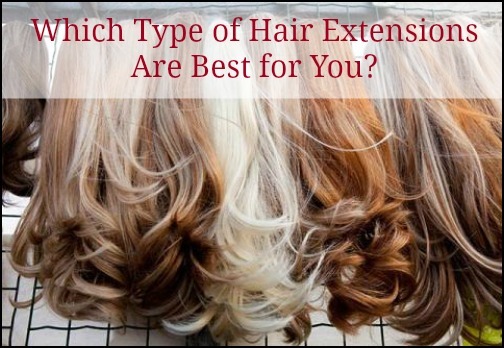 Just like other hair extensions, there are different types of hair you can choose from. There are real human hair weaves as well as synthetic hair weaves. The synthetic hair weaves may only cost you approximately $250-$400 while the real human hair weaves may be more expensive at around $800-$1200. Now that you know ho much hair extensions cost you can have a better idea of what may work best for your hair as well as for your wallet. You may choose to go with the clip in hair extensions to see if the style you want will look good on you and then decide to go with professionally done hair hair extensions. Or maybe you simply want the best and need to find a good stylist who does cold fusion hair extensions. One last tip before you decide to go get your hair extensions is to also consider not only the up front cost but the maintenance cost as well as how long the hair extensions will last. You may only want the extensions for a few months so it may be silly to get ones that will last longer. This is especially true if you tend to change up your hair frequently. It’s not a bad idea to call around to different salons just to see what the base price for hair extensions is as well as do your own research for extensions you can do yourself.